Do you still think it's not possible to have a budget dining at hotels? Well, it's now possible. It's possible even at urban hotels within your reach, Novotel Ambassador Gangnam and Ibis Ambassador Seoul which offer affordable dining experiences at as low as 21,500won. 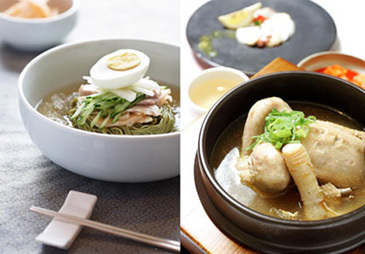 The buffet restaurant "Festival" at Novotel Ambassador Gangnam features various health dishes including cold summer noodles, chicken broth with ginseng, frappe and more. Available from June 4 through September 2, the special summer buffet is offered at 36,000won and 43,000won for lunch and dinner respectively. On June 4, Festival members and accompanied guests receive a 50% discount. Ibis Ambassador Seoul, known for its affordable yet authentic dining, presents "Thai Promotion" from June 4 to 15 at its restaurant "La Table." The promotion is a great budget dining for Thai cuisine fans with lunch priced at only 21,500won. Dinner is also available at 25,000won. LG Smile and LG The Best cardholders receive a 20% discount. A 10% discount is also given to LG Big Plus, Lady and Easy cardholders. Also, free prizes are drawn during the promotion featuring wine voucher, buffet dining coupon and free weekend accommodation at Ibis Ambassador Seoul.